Congrats! Your child just knocked out the application paperwork and is one step closer to becoming a Lion. We know this season of life can be hectic, so we’ve compiled information you might be looking for here and tailored it to your interests. If you need us, we’re only a call away! Welcome to the Lion life! When your child joins our pride, so do you. We are so excited to have you on this adventure. Take a look at your next steps and be sure to check in with our community calendar for important events and announcements! So, you’ve decided to add one more diploma to your wall? That’s what we like to hear! Read up on admission requirements and the application process below, then let’s get started. We can’t wait to see what you do as a Lion! Are you looking for a new route to your degree? Need a change of scenery? Welcome to your guide for the A&M-Commerce transfer student application process. We can’t wait to have you in our pride. Check your myLeo email account to receive messages regarding your status. You will receive award notifications with directions on how to accept your offers, missing information requests and other pertinent financial aid and scholarship information. If you are not receiving email updates, please contact fao_web@tamuc.edu. One of the most exciting aspects and an integral part of the university experience is the opportunity to reside in one of our campus residential living and learning facilities. Studies suggest that students who reside on campus generally perform better academically, as opposed to students residing off campus. Please visit the Department of Residential Living And Learning where you may download the housing application and access additional residence life resources. Requirements for bacterial meningitis vaccination. New Student Orientation is an important and mandatory step in becoming a part of the university family. All new students (freshman and transfer) attending the main campus in Commerce are required to participate in new student orientation. Orientation is offered multiple times during the summer months before the start of the fall semester. For spring students, orientation is offered late in the fall prior to the spring semester. For more information concerning new student orientation, please contact: 903.886.5088 or visit the website above. We’re thrilled about your interest in studying at A&M-Commerce and we can’t wait to give you a warm Southern welcome. As you go through the admission process, use this page as a guide and source for important information. Welcome to the next chapter in your story! We can’t wait to review your application. Check out the admission requirements and other important information listed below. The information below will guide you through the admission process, but we’re only a call away if you need us. You’re one step closer to becoming a Lion! 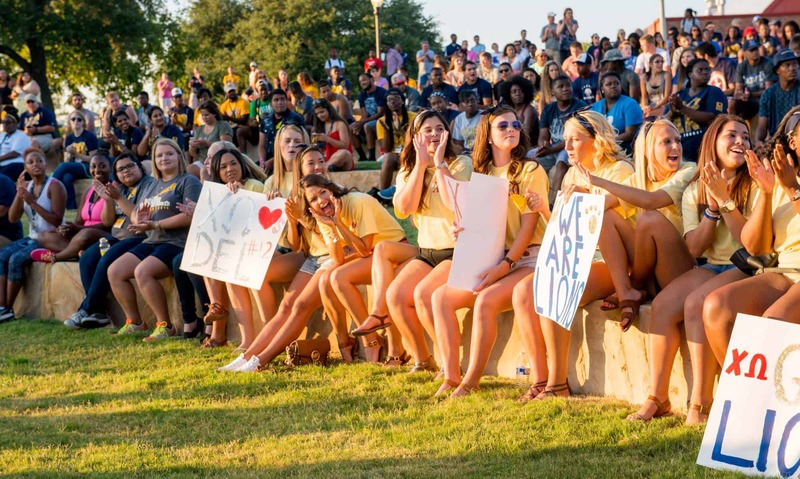 GET READY TO BE AN A&M-COMMERCE FRESHMEN! Follow this list and you will be a LION in no time! College is the next big step in your academic journey! Learn more about graduation requirements and how they impact A&M-Commerce Admissions. Consider the field of study and degree program you want to pursue at A&M-Commerce. Take some time to research our degree programs. A&M-Commerce offers over 100 different degrees as well as special programs designed to provide the support you need for success! Request information about the degree programs that interest you most. Our Admission Recruiters want to do everything they can to help you learn about A&M-Commerce and guide you through the process! Meet one of the following requirements to be automatically accepted into the Lion Pride. *Scores prior to March 2016 include math and critical reading scores only. Scores after March 2016 include math and evidence-based reading/writing only. Use ApplyTexas.org and choose Texas A&M University-Commerce as your school of choice. Please submit an official, sealed copy of your transcript from each school you previously attended so we can process your admission application. Include a transcript from all schools, including proprietary/career schools, regardless of how long it’s been since you last attended. Dual-credit freshmen must also submit an official transcript from the institution that offered the dual-credit classes. If you are a senior in high school, please send a transcript through your junior year. For faster delivery, you may check to see if your previous/current academic institution(s) can submit an electronic version of your transcript to the Undergraduate Admissions Office. If they offer electronic transcript service, they will provide you with further instructions about how to use this option. A&M-Commerce accepts SPEEDE, National Clearinghouse and Escript-Safe electronic transcripts. All students are required to complete the state-legislated Texas Success Initiative (TSI) assessment unless an exemption applies. Students are responsible for providing proof of exemption and will be considered assessment required until documentation is provided of state exemption. For more information, please contact the Testing Center at TestingOffice@tamuc.edu. Use the A&M-Commerce codes 4088 (ACT) and 6188 (SAT) to submit your scores on act.org or collegeboard.org. More than 70% of our undergraduate students receive financial aid. Find out how you may be eligible for grants, loans and/or the Work Study Program. Check your myLeo account for admission status, financial aid and scholarship info, registration, updates and deadlines. Residents of foreign countries who wish to enter the university should apply to the Office of Undergraduate Admissions well in advance of the semester they plan to attend. Please note that an international student is any degree-seeking student holding a non-immigrant student visa. All admission requirements are to be completed a minimum of three months prior to the beginning of the semester. In the case of extenuating circumstances, exceptions to this timeline may be considered on an individual basis. Texas A&M University-Commerce requires that the international applicant show proof of successful completion of a course of study equivalent to that required of a U. S. citizen. Your international transcript must be evaluated by an independent credential evaluation agency before we consider you for admission to A&M-Commerce (See Step 6). Meet the following requirements to be automatically accepted into the Lion Pride. All international undergraduate students applying to A&M-Commerce must complete the freshman ApplyTexas application for international students. Complete your high school transcript through your junior year. The international applicant must show proof of successful completion of a course of study equivalent to that required of a U. S. citizen. Your international transcript must be evaluated by an independent credential evaluation agency before we consider you for admission to A&M-Commerce. For freshman admission, high school transcripts need only be evaluated to determine U.S. high school equivalency. Dual-credit freshmen must also submit an official transcript from the institution that offered the dual-credit classes. Transcripts must be evaluated by an independent credential evaluation agency before a student is considered for admission. The applicant must be adequately proficient in English to pursue a course of study at the university. A score of at least 550 paper-based, 213 computer-based or 79 internet-based on the Test of English as a Foreign Language (TOEFL) and an official report of these scores must be submitted to the Office Undergraduate Admissions prior to admission. Please keep in mind that Education Testing Service (ETS) will not release scores that are older than two (2) years. Students who have completed Eng 1301 and Eng 1302, at a U.S. institution, with a grade of âCâ or better. Students may provide a certified older score if they have been continuously studying at a U.S. college or university. Students who have successfully completed the Texas International Education Consortium (TIEP's) advanced-level program as defined in the information provided by TIEP and who are seeking admissions to our campus. Students who have completed a minimum of one year of study in a Texas public high school with the completion of English III or English IV (including Advance Placement/AP) with a grade of âBâ or better. Students who are citizens of Australia, New Zealand, the British Virgin Island, Jamaica, United Kingdom, Ireland, Antigua, Northern Ireland, Scotland, South Africa, St. Lucia, Wales, Bahamas, Barbados, and Canada (excluding French-speaking Quebec), Switzerland. Proof of citizenship must be provided such as birth certificate or passport. A Sponsor's Statement (signed by the sponsor) with a current bank statement showing a balance of at least $28,109.00 USD must be submitted to the Office of Undergraduate Admissions. Sponsor's statements and bank statements must be less than one year old at the time of application. All educational and living expenses (including medical/repatriation insurance) are the responsibility of the student. To help you pay for your degree, a variety of institutional scholarship opportunities are available at A&M Commerce when you are officially admitted. The Freshmen and Transfer Student Access and Success Scholarship program is automatically awarded on a first-come, first-served basis as funds are available. Apply for admissions early! There is a wide range of Department and Endowment scholarships you can apply for through the myLEO scholarship student portal. The deadlines for applications vary from department to department. There are also outside scholarships that you may be able to apply for directly. Outside scholarship deadlines vary but have very early deadlines. Check out the list of outside scholarships. After admission, the Office of International Programs (OIP) will review a student's documents for eligibility to receive an I-20 (F-1 visa) or DS-2019 (J-1 student). As soon as the OIP receives a student's admission file we will send the student an email requesting some additional information and also explaining the process for issuing the I-20. We understand that students need the I-20 as quickly as possible so they can apply for the student visa, and we appreciate students' patience while we review their admission and issue the I-20. J-1 international students are required to provide proof of financial support that equals the estimated cost for one year of study at A&M-Commerce. This requirement is based on the financial support requirements for all F-1 students. These documents are bank and sponsor statements. Texas state law requires all new students 21 years of age or younger to either receive a bacterial meningitis vaccination or meet the exemption requirements prior to the first day of their first semester. Students who fail to submit their proof of vaccination and have their vaccination approved at least 10 days prior to the first day of their first semester may not be allowed to attend classes at A&M-Commerce. Please note that failure to meet this requirement (only students 21 years of age or younger) may result in serious visa status issues. Check your account for admission status, financial aid and scholarship info, registration, updates and deadlines through myLeo. When submitting documents, please keep in mind that mail between the United States and other countries can take as long as four weeks. Sufficient time should be allowed for processing documents. The application deadline is ninety (90) days prior to the beginning of the semester of enrollment. At that time, all required forms (listed above) must be on file with the Texas A&M University-Commerce Office Undergraduate Admissions. The International Student Guidebook provides very important pre-arrival and arrival information for our new students. The OIP has compiled information for the most frequently asked questions or new international students have each semester. Follow these steps to begin your journey to a graduate degree. Pick your master's program and contact the adviser listed on each program page if you have any questions. Refer to your program's page for the complete list of admission requirements. You may pay your application fee when you apply online or at a later date. Your username, Campus Wide ID (CWID) number, password and admission details will be emailed to you within two business days. Your email will include information about submitting your admission documents to A&M-Commerce. Once you receive your Campus Wide ID (CWID), password and admission details, you may access your student portal, myLeo, to track your application status. All the documents required for admissions consideration will be displayed under your application status and updated as your documents are received. All international students must submit official transcripts and official copies of diplomas, translated into English, from each college or university attended. The bachelor's degree earned at a foreign institution must be equivalent to an accredited U.S. institution's four-year degree. Official copies of all transcripts (with the school seal) and official copies of diplomas must be sent to the Office of Graduate Studies. Request official test scores (if applicable to your program) to be sent to the Graduate School. Our university code for GRE and TOEFL is 6188. Our university code for GMAT is 7B7-X952. All international students are required to submit an official proof of English proficiency. Apply for scholarships and/or graduate assistantships. Check available scholarships and graduate assistantship opportunities. Calculate the cost of your program using the tuition calculator. Check your application status, account, scholarship info, emails, deadlines and other info through myLeo. Check your application status, account, financial aid and scholarship info, emails and deadlines through myLeo. After admission, the Office of International Programs (OIP) will review a student's documents for eligibility to receive an I-20 (F-1 visa) or DS-2019 (J-1 student). As soon as the OIP receives a student's admission file they will send the student an email requesting some additional information and provide information about the process for issuing the I-20. We understand that students need the I-20 as quickly as possible so they can apply for the student visa, and we appreciate students being patient while we review their admission and issue the I-20. The student must submit an official sponsor statement and a bank statement from the student's sponsor, must reflex a balance of at least $26,024.82 USD and must be less than 1 year old. For more information on the process to issue the immigration documents and application process for a visa, please contact the International Student Services office at 903.886.5097 or email intl.stu@tamuc.edu. Check your account for admission status, scholarship info, updates and deadlines through myLeo. Upon arrival at Texas A&M University-Commerce, please check-in with the OIP. You will be able to register after check-in. We are all rooting for you - professors and staff alike! Your graduate school experience should be some of the most rewarding years of your academic life. The New International Student Guidebook provides very important pre-arrival and arrival information for our new students. The OIP has compiled information for the most frequently asked questions or new international students have each semester. For more information go to International Student Guidebook. When submitting documents, please keep in mind that mail between the United States and other countries can take as long as four weeks. Sufficient time should be allowed for processing documents. The application deadline is ninety (90) days prior to the beginning of the semester of enrollment but some programs have earlier deadlines. At that time, all required forms (listed above) must be on file with the Texas A&M University-Commerce the Graduate School. GET READY TO BE AN A&M-COMMERCE LION! You are a transfer student if you are a high school graduate seeking first-time admission to our institution but have previously attended another post-secondary institution of higher learning. A&M-Commerce is committed to making the transfer process as smooth as possible. a 2.0-grade point average (GPA) or higher on all transferable coursework. If you do not meet the admissions criteria above, you are encouraged to continue at your current school or attend a community college until you have the transfer hours and GPA. All students are eligible to appeal the admissions decision. Students will be notified in their admissions letter which required documents are needed to complete the appeal process. For more information on how to appeal the admissions decision, please email transferadmissions@tamuc.edu. Please submit an official, sealed copy of your transcript from each school you previously attended so we can process your admission application. Include a transcript from all schools, including proprietary/career schools, regardless of how long it's been since you last attended. Coursework from these schools will be reviewed for applicability to your degree program. Complete the state-legislated Texas Success Initiative (TSI) assessment unless an exemption applies. To help you pay for your degree, a variety of scholarship opportunities are available at A&M-Commerce including institutional scholarships, outside scholarships and state-funded scholarships. All scholarships are awarded on a first-come, first-served basis as funds are available, so apply as early as you can! Residents of foreign countries who wish to enter the university should apply to the Office of Undergraduate Admissions well in advance of the semester they plan to attend. If you do not meet the admission criteria above, you are encouraged to continue at your current school or attend a community college until you have obtained the required transfer hours and GPA. All students are eligible to appeal the admissions decision. Students will be notified in their admissions letter about the required documents needed to complete the appeal process. For more info, please email transferadmissions@tamuc.edu. All international undergraduate students applying to A&M-Commerce must complete the ApplyTexas application for international students. The international applicant must show proof of successful completion of a course of study equivalent to that required of a U. S. citizen. Your international transcript must be evaluated by an independent credential evaluation agency before we consider you for admission to A&M-Commerce. For Transfer Admission, college transcripts should be evaluated course by course and semester by semester. There is a wide range of department and endowment scholarships you can apply through the myLEO scholarship student portal. The deadlines for applications vary from department to department. There are also outside scholarships that you may be able to apply to directly. Outside scholarship deadlines vary but do have very early deadlines. Check out the list of outside scholarships. Below are the admission requirements for international students for the master's and specialist programs. Some programs provide options for the GRE/GMAT scores. Each program may have additional requirements as well. You may review the specific program requirements by selecting your program of interest from our Graduate Programs list. any master's degree transcript or transcripts with graduate coursework (if applicable). Official GRE/GMAT Scores. Some programs provide options for the GRE/GMAT score requirement. See the Graduate Programs list for details. Bank statement from the sponsor. Must reflect a balance of at least $26,024.82 USD and must be less than 1 year old. Official transcripts (from India: must include original mark sheets with a copy of the provisional certificate or diploma; submitting only a consolidated mark sheet is not sufficient). For more information on official transcripts, please click here and read FAQ question: What transcripts do I submit for my admission? Remember - a program may have additional admissions requirements. Review the specific admissions requirements by selecting your program of interest from our Graduate Programs list. Apply for graduate programs, education certification, graduate certificates and non-degree status at ApplyTexas. We are so excited about your interest in Texas A&M University-Commerce! As a member of one of the nation's outstanding university systems, Texas A&M University-Commerce will provide you with an excellent atmosphere for academic achievement, personal growth, and leadership development. Since its beginning in 1889, the University has responded to the needs of a changing world while holding fast to its tradition of excellence in education. Mindful of this historic mission, we have a deep commitment to provide each student with a safe and quality educational environment in which each individual's goals and aspirations may be accomplished. All graduate students applying to Texas A&M University-Commerce must complete the ApplyTexas application for International students. Graduate Language Proficiency: The applicant must be adequately proficient in English to pursue a course of study at the University. An official report of these scores must be submitted to the Office of Graduate Studies prior to admission. Graduate Summary of Documents Required for Admission: When submitting documents, please keep in mind that mail between the United States and other countries can take as long as four weeks. Sufficient time should be allowed for processing documents. The application deadline is ninety (90) days prior to the beginning of the semester of enrollment. At that time, applicants must have the following on file with the Texas A&M University-Commerce Office of Graduate Studies and Research. Texas A&M University-Commerce requires that the International graduate applicant show proof of successful completion of a course of study equivalent to that required of a U. S. citizen. Each applicant must submit the following documents to the Office of Graduate Studies and Research. A $75.00 USD non-refundable application fee. A sponsor's statement with a current bank statement showing a balance of at least $26,024.82 in U.S. currency. a. A minimum TOEFL score of 550 for paper-based testing (PBT) or 213 on computer-based testing (CBT) or 79 internet-based testing (IBT). b. A minimum IELTS score of 6.0 overall band. c. Completing all years of a Bachelor's degree or higher degree at the U.S. regionally accredited university. d. Successful completion of Texas A&M University-Commerce English Language Institute (ELI) with an overall grade of B. An official Graduate Record Examination (GRE) score or a Graduate Management Admission Test (GMAT) score sent by Educational Testing Service to A&M-Commerce. Some programs provide options for the GRE/GMAT score requirement. You may view the specific program admission requirements by selecting your program from the list of graduate programs. Grade point average (GPA) requirements are the same as those for the appropriate degree program. Each applicant is subject to departmental approval. Individual departments may establish additional requirements for admission. International students must be admitted to a degree program in order to enroll in graduate courses unless visa classification indicates otherwise. International students who hold an F-1 visa are not eligible for nondegree student status or provisional admission status. Follow these steps to begin your journey to a Specialist degree. Pick your specialist program and contact the adviser listed on each program page if you have any questions. Apply for Scholarships and/or graduate assistantships. Check available scholarships and graduate assistantships opportunities. Calculate the cost of your program using the tuition calculator. Check your application status, account, scholarship info, emails and deadlines through myLeo. Follow these steps to begin your journey to a doctoral degree. Pick your doctoral program and contact the adviser listed on each program page if you have any questions. Check your application status, account and scholarship info, emails and deadlines through myLeo. New International Student Guidebook The New International Student Guidebook provides very important pre-arrival and arrival information for our new students. The OIP has compiled information for the most frequently asked questions or new international students have each semester. For more information go to International Student Guidebook. Request official transcripts from all institutions you have attended be sent to the Graduate School. Upload your documents through your student portal, myLeo. Request official test scores (if applicable to your program) be sent to the Graduate School. Apply for Scholarships and/or graduate assistantships. Check available scholarships, graduate assistantships, andfinancial aid opportunities. Calculate the cost of your program using the tuition calculator. When you have been admitted to your program, your myLeo account will be updated and you will receive your admission letter via email. You will also be connected immediately with your academic advisor. That advisor will assist you with your degree plan and steps to register. View your online degree plan in Grad DegreeWorks through myLeo. Apply for Scholarships and/or graduate assistantships. Check availableÂ scholarships,Â graduate assistantships, andÂ financial aid opportunities. Calculate the cost of your program using the tuition calculator. Students not seeking a graduate degree may enroll in graduate courses for career enhancement or personal development. Follow these steps to begin the process to take graduate classes at A&M-Commerce. Select your courses. View the Schedule of Classes for all course offerings. Calculate the cost of your program using the in tuition calculator. Check your application status, account, emails and deadlines through myLeo. When you have been admitted to your program, your myLeo account will be updated and you will receive your admission letter via email. Follow these steps to begin your journey to a graduate certificate. Pick your certificate program and contact the adviser listed on each program page if you have any questions. When you have been admitted to your program, your myLeo account will be updated and you will receive your admission letter via email. View your online degree plan in Grad Degreeworks through myLeo. Follow these steps to begin your journey to a educator certification. Pick your educator certification program and contact the adviser listed on each program page if you have any questions. Calculate the cost of your program using the tuition calculator. The information below will help you prepare for admission to A&M-Commerce. All graduate students applying to Texas A&M University-Commerce must complete the ApplyTexas application for International students. Contact your graduate recruiter for additional information. Some programs have additional application submission deadlines. Click here to choose your program and view admission details including deadline dates. Official transcripts and official copies of diplomas, translated into English, from each college or university attended. The bachelor's degree earned at a foreign institution must be equivalent to an accredited U.S. institution's 4-year degree. For more information on the process to issue the immigration documents and application process for a visa, please contact the International Student Services office at 903-886-5097 or email intl.stu@tamuc.edu. Submit official transcripts with a copy of the provisional certificate or diploma. Upload your documents through your student portal, myLeo. Apply for Scholarships and/or graduate assistantships. The following sources may help you evaluate and transfer your international course credits. As a member of one of the nation's outstanding university systems, Texas A&M University-Commerce will provide you with an excellent atmosphere for academic achievement, personal growth and leadership development. Since its beginning in 1889, the university has responded to the needs of a changing world while holding fast to its tradition of excellence in education. Mindful of this historic mission, we have a deep commitment to provide each student with a safe and quality educational environment in which each individual's goals and aspirations may be accomplished. An international student is any degree-seeking student holding a nonimmigrant student visa. All International undergraduate students applying to Texas A&M University-Commerce must complete the freshman or transfer ApplyTexas application for International students. Academic Requirements: Texas A&M University-Commerce requires that the International applicant show proof of successful completion of a course of study equivalent to that required of a U. S. citizen. Your international transcript must be evaluated by an independent credential evaluation agency before we consider you for admission to Texas A&M University-Commerce. For Transfer Admission, college transcripts should be evaluated course by course and semester by semester. For Freshman Admission, high school transcripts need only be evaluated to determine U.S. high school equivalency. Undergraduate Language Proficiency: The applicant must be adequately proficient in English to pursue a course of study at the University. A score of at least 550 paper-based or 213 computer based or 79 Internet based on the Test of English as a Foreign Language (TOEFL) and an official report of these scores, must be submitted to the Office Undergraduate Admissions prior to admission. Please keep in mind that Education Testing Service (ETS) will not release scores that are older than two (2) years. Students who have completed Eng 1301 and Eng 1302, at a U.S. institution, with a grade of C or better. Students may provide a certified older score if they have been continuously studying at a U.S. college or university. Students who have completed the advanced level with a grade of an A or B at the A&M-Commerce English Language Institute (ELI). Students who have successfully completed the Texas International Education Consortium (TIEPs) advanced-level program as defined in the information provided by TIEP and who are seeking admissions to our campus. Students who have completed a minimum of one year of study in a Texas public high school with the completion of English III or English IV (including Advance Placement/AP) with a grade of B or better. Students who are citizens of Australia, New Zealand, the British Virgin Island, Jamaica, United Kingdom, Ireland, Antigua, Northern Ireland, Scotland, South Africa, St. Lucia, Wales, Bahamas, Barbados, and Canada (excluding French-speaking Quebec), Switzerland. Proof of citizenship must be provided such as a birth certificate or a passport. Undergraduate Sponsor's Statement: All educational and living expenses (including medical/ repatriation insurance) are the responsibility of the student. A Sponsor's Statement (signed by the sponsor), with a current bank statement showing a balance of at least $28,109.00 USD must be submitted to the Office of Undergraduate Admissions.Â Sponsor's Statements and bank statements must be less than one year old at the time of application. The Office of Undergraduate Admissions does not charge an application fee to process your documents. Upon enrollment in your first semester at Texas A&M University-Commerce, your account will be assessed with a $60.00 non-refundable enrollment fee. For International students that do not meet the TOEFL requirements or other language proficiency exemptions, A&M-Commerce offers an English Language Institute (ELI). An international student is any degree-seeking student holding a non-immigrant student visa. Residents of foreign countries who wish to apply must meet the transfer requirements stated above. submit TOEFL scores of at least 550 (PBT) or 213 (CBT) or 79 (IBT). Please visit our international student admissions website for additional information. A&M-Commerce accepts scores from the SAT (math and critical reading scores only) or ACT (composite score) and you are not penalized for taking the test several times. We accept your best score for admission to the university. Complete the ApplyTexas Application to begin your journey! Complete the admission application and list Texas A&M University-Commerce as your school of choice. The applytexas application is one application for any public institution in the state of Texas. A&M-Commerce does not charge an application fee. Two sequences of American/Texas Government are taught at Texas community colleges and universities. Texas Common Courses, GOVT 2305 and GOVT 2306, transfer directly as course equivalents to PSci 220 and 221, respectively. Texas Common Courses, GOVT 2301 and 2302, are NOT direct course equivalents for PSci 220 and 221. However, GOVT 2301 and 2302 do transfer together as a complete sequence for PSci 220 and 221. Due to the differences in course content at Texas community colleges and universities, it is strongly recommended that students complete the required courses in American/Texas government at the same institution. Students seeking to combine courses from the two sequences should use caution and be aware that only the following alternative combinations of GOVT 2301 and PSci 220/GOVT 2305 or GOVT 2301 and PSci 221/GOVT 2306 fulfill the content requirement of the state of Texas. Courses taken at junior or community colleges cannot transfer as advanced hours (course numbers beginning with a 3 or 4 indicate advanced hours). The applicability of transferred credit toward a degree is subject to the preparation of an advisement guide within an academic department. Students must complete a minimum of sixty (60) semester hours from an upper division institution. While all credit hours presented on the sending institution's transcripts will be evaluated and equivalent college-level courses posted to the student's academic record, a maximum of sixty-six (66) semester credit hours from a junior or community college may be applied toward degree requirements. College preparatory course work in remedial math, reading and writing are not transferable and do not satisfy college-level requirements at A&M-Commerce. When a course is repeated, only the last enrollment for that course will be used in computing the grade point average. The second grade will be used to determine credit earned for the course. A grade of "D" is transferable, but a minimum grade of "C" is required in all undergraduate courses in the academic major. Courses that transfer but do not have exact equivalent numbers at A&M-Commerce are listed as generic credit. At the discretion of the major department, these courses may fulfill specific degree requirements. Core courses completed at other Texas public colleges and universities will satisfy core requirements at A&M-Commerce. The transfer grade point average will be used to determine admissibility to the University and scholarship eligibility. Official cumulative grade point average is calculated only on courses taken at A&M-Commerce. WebTreQer is an online tool for prospective transfer students that allows you to check your transfer course credits to see how they will be accepted and count towards your degree at A&M-Commerce. This application is an unofficialweb-based degree checklist program and academic advising tool designed to assist you in reviewing degree progress. It organizes academic transcripts chronologically and categorically, identifying courses you have completed and courses still needed to fulfill the degree requirements. Use this password - WebTreQer. Step 5: Provides information on your next step to attend A&M-Commerce. The results from this website are not official. The reports you create should only be used as a guide to help you understand how your transfer classes may equate to classes here and to how those classes may apply to degree requirements. The Texas Core Curriculum includes 42 semester hours of required coursework for all Texas undergraduate students. The Core Curriculum helps ensure that Texas undergraduate students develop essential knowledge and skills. Thirty-six semester hours (36 SH) of coursework from a broad variety of disciplines across eight Foundational Component Areas. Six semester hours (6 SH) that meet requirements for any one of the Foundational Component Areas. Institutions are allowed to select those six hours to meet institutional priorities and mission. This six-hour element of the Texas Core Curriculum is called the Component Area Option. Students must complete two semesters of English composition. Communication courses focus on developing ideas and expressing them clearly, considering the effect of the message, fostering understanding, and building the skills needed to communicate persuasively. Courses in communication promote the Texas state Core Objectives of critical thinking, communication, teamwork, and personal responsibility. Students must complete a minimum of one college-level mathematics course. Mathematics courses focus on quantitative literacy in logic, patterns, and relationships. Courses in mathematics promote the Texas state Core Objectives of critical thinking, communication, and empirical and quantitative skills. Mathematics courses should be selected based upon completion of the appropriate prerequisites. Math courses also are often very major-specific; in other words, one size does not fit all. All students should refer to the catalog and seek the advice of a success coach or professional advisor about the appropriate math selections for their major. Students must complete six hours of life and physical science. Courses in this category focus on describing, explaining and predicting natural phenomena using the scientific method. Courses in the life and physical sciences promote the Texas state Core Objectives of critical thinking, communication, empirical and quantitative skills, and teamwork. Four credit hour science courses are intended for students majoring in science, engineering or agriculture fields, as well as some within the College of Education and Human Services. These students should complete TWO four credit hour (three-hour lecture and one-hour lab) science courses. Selecting the wrong science courses can delay completion of key pre-requisites and graduation. Three credit hour and one credit hour (labs) courses for the life and physical science component area are intended for students not majoring in science, engineering, or agriculture fields. These courses are marked with an asterisk (*) below and are either designed specifically for non-science majors or open to non-science majors. When the course is a lab, it is permissible for non-science majors to take the lab apart from the three-hour lecture. Science majors must take both a lecture and a lab if choosing from this list of courses. The same lecture and lab course may not be repeated (unless failed) in order to meet the six-hour life and physical science core requirement. All students should seek the advice of a success coach or professional advisor when choosing science courses to meet their core curriculum requirements. Students must complete three hours of Literature, Philosophy, and Culture. Courses in this category focus on how ideas, beliefs, and other aspects of human culture affect human experience. Literature, Philosophy and Culture courses promote the Texas state Core Objectives of critical thinking, communication, social responsibility, and personal responsibility. Students must complete three hours of coursework in Creative Arts. Courses in this category focus on the appreciation and analysis of creative artifacts and works of the human imagination. Creative Arts courses promote the Texas state Core Objectives of critical thinking, communication, social responsibility, and teamwork. State law mandates six hours of American history survey. Courses in this category focus on the consideration of past events and ideas relative to the United States. Courses in this category promote the Texas state Core Objectives of critical thinking, communication, social responsibility, and personal responsibility. State law mandates six hours of US and Texas government. Courses in this category focus on consideration of the Constitution of the United States and the constitutions of the states, with special emphasis of that of Texas. Courses in this category promote the Texas state Core Objectives of critical thinking, communication, social responsibility, and personal responsibility. At A&M-Commerce, the two-course sequence PSCI 2301/2302 meets this requirement. Other two-course sequences are offered elsewhere. Mixing a course from other sequences into the PSCI 2301/2302 sequence can delay graduation. All students should seek the assistance of a success coach or professional advisor when choosing political science courses to meet their core curriculum requirements. Students must complete three hours of coursework in Social and Behavioral Science. Courses in this category focus on the application of empirical and scientific methods that contribute to the understanding of what makes us human. Social and Behavioral Science courses promote the Texas state Core Objectives of critical thinking, communication, empirical and quantitative skills, and social responsibility. At A&M-Commerce the Component Area Option consists of two elements. First, all students must take one course in speech communication from the two listed below. Second, all students must complete an additional three hours corresponding to requirements of their particular degree (Degree Pathway). For instance, a student pursuing a Bachelor of Science degree must take an additional math or science course for his/her Component Area Option. All students should seek the advice of a success coach or professional advisor when choosing political science courses to meet their core curriculum requirements. * Indicates courses either designed specifically for non-science majors or open to non-science majors. When the course is a lab, it is permissible for non-science majors to take the lab apart from the three-hour lecture. Science majors must take both. Texas A&M University-Commerce will honor core curriculum courses from other Texas public institutions and apply those toward completion of the A&M-Commerce core curriculum. Whether students are transferring or starting and finishing with A&M-Commerce, completion of the core curriculum is a graduation requirement. Students should seek the help of their success coach or professional advisor in selecting appropriate courses to meet these requirements. Find the transfer guide for your previous college or university listed below. A&M-Commerce's dual (concurrent) graduate degrees option enables students to earn two graduate degrees with significant savings in time and cost. Students may pursue dual master's/specialist degree programs with the approval of the department head and graduate dean. Students in any dual master's/specialist degrees must be admitted to each participating degree and must meet all the requirements for each degree. For 30-semester-hour degrees, no more than 9 approved hours. For 36-semester-hour degrees, no more than 12 approved hours. For the 62-semester-hour MFA, no more than 20 approved hours. A thesis cannot be shared between the two graduate degrees. A 595 Research Literature and Techniques course can only be shared between the two graduate degrees with department and Graduate School approval. All remaining courses applied to satisfy the requirements for the two graduate degrees must be A&M-Commerce courses. The dual master's/specialist degrees will be subject to the general regulations governing master's/specialist degrees except as stated above. Students who wish to pursue dual master's/specialist degrees must apply for admission to each program. Contact your Graduate Services Coordinator for additional information. Students interested in pursuing a dual program with a master's/specialist degree and a doctoral degree should contact the Doctoral Degree Coordinator. Please contact one of the following agencies for an evaluation of your academic transcript. Your health is a priority here! Texas Senate Bill 62 requires all students under age 22 entering an institution of higher education (public and private) to either receive a vaccination against bacterial meningitis or meet certain criteria to decline the vaccination 10 days before the first day of the semester. 1. Log into myLEO to enter the Student Portal. You will need your CWID number and password. 2. Click on the myLEO link at the top of the page to enter the Self-Service page. 3. Click on the Verify Meningitis Shot Requirement link found on the Main Menu. 4. You will automatically be directed to Magnus Health’s SMR account page. 5. Your myLEO account is linked to your Magnus Health account through a single sign-on; therefore, you do not need to create an additional username and password. 6. You will be asked to verify your personal information. 7. You will pay a one-time $11 processing fee, payable to Magnus Health SMR (debit or credit card required). 8. You will then be guided through the rest of the verification process through Magnus Health. 9. You can access Magnus Health’s SMR by logging into your myLEO account at any time. How to complete vaccination requirement? A&M-Commerce uses the services of Magnus Health to collect, review and securely store all student documents pertaining to the meningitis vaccine. All first-time and former students that fall under this requirement must register through Magnus Health’s SMR to ensure that the course registration process is not delayed. The vaccine must be administered within the past five years and administered at least 10 days prior to the first day of classes in the semester for which you are beginning at A&M-Commerce. New Students will be allowed to register for their New Student Orientation session BUT will not be allowed to register for classes if the Bacterial Meningitis vaccination requirement has not been met by their orientation session date. How will I know if a vaccination requirement applies to me? What are my options if I wish to decline the vaccination? You must obtain a waiver, signed by a physician who is duly registered and licensed to practice medicine in the United States, stating that, in the physician’s opinion, the required vaccination for bacterial meningitis would be injurious to your health and well-being. You must sign and submit a notarized affidavit stating that you decline the required vaccination for bacterial meningitis for reasons of conscience, including religious belief. Additional information can be found at College Vaccine Requirements. You will also receive instructions on how to request affidavit forms from the Texas Department of State Health Services once you’ve created your Magnus Health account in your myLEO. The original affidavit document must be mailed to Magnus Health. To learn more about your options, please visit the Mangus Health Help Desk. What vaccinations are acceptable to meet this requirement? At this time, the Men B vaccination will be accepted to meet the vaccination requirement. Students should consult a physician or medical practitioner to determine the optimum vaccination protocol for their individual needs. It is important to note that vaccinations for Men ACWY and Men B are not interchangeable. Men B vaccines do not provide protection for Men ACWY strains and Men ACWY vaccines do not provide protection for Men B strains. Where can you get vaccinations? Check with your local healthcare provider. This vaccination could be covered by your insurance provider. Local facilities that offer the Menomune, Menactra, and Menveo vaccinations are listed below. Cash prices may vary, so please check your local area. Where do I submit my forms or vaccination records? You will not submit your forms or vaccination records to A&M-Commerce. Once you’ve created your Magnus Health account, you will submit all documents through your SMR (Student Medical Record) by uploading, faxing, or mailing them directly to Magnus Health. Detailed instructions on how to submit the required documentation are available via a 60-second, introductory video that plays when you log in to your account. If you need additional assistance, please contact Magnus Health’s customer service. Can I apply previously completed courses to my second master’s/specialist degree? Subject to the approval of the department head and graduate dean, students holding master’s/specialist degrees from a regionally accredited graduate institution in the United States may apply certain courses that were a part of a previously earned graduate degree toward a second master’s/specialist degree, provided such courses are not more than 6 years old at the time the second master’s degree is conferred. A thesis completed for a previous degree cannot be used for a second master’s/specialist degree. A 595 Research Literature and Techniques course can only be used for a second master’s/specialist degree with department and Graduate School approval. All remaining courses applied to satisfy the requirements for the second master’s/specialist degree must be A&M-Commerce courses. The second master’s/specialist degree will be subject to the general regulations governing master’s degrees except as stated above. After a degree is awarded, courses taken before the degree was awarded (regardless of whether the course is applied to the degree) cannot be repeated and the grade point average cannot be recalculated. Students who wish to pursue a second master’s/specialist degree must apply for admission to the second master’s/specialist degree. Contact your Graduate Services Coordinator or additional information. Can I transfer dual credit classes? Dual credit classes are college courses that you have taken through your local community college that also counted toward your high school diploma. In order to receive transfer credit from A&M-Commerce for dual credit classes, you must submit official transcripts to the Office of Undergraduate Admissions from the community college or university where you took your dual credit classes. For more information or questions, please contact the Office of Undergraduate Admissions at 903-886-5000 or admissions@tamuc.edu. Do you accept Advanced Placement Program (AP) courses? Yes! A&M-Commerce accepts scores on certain College Board Advanced Placement (AP) tests for credit in selected courses. Examinations offered by the AP program are administered during late spring by high schools. Interested high school students should contact their high school counselors for information on AP courses their school offers. AP scores should be forwarded to A&M-Commerce Student Assessment Office. The College Board code for A&M-Commerce is 6188. Scores reported from the spring AP test administration will not be received until late July. For a complete list of AP courses and scores required for credit, please visit the website. For more information or questions, please contact the Office of Undergraduate Admissions at 903.886.5000 or admissions@tamuc.edu. How do I apply for College of Business? Complete an Application via Apply Texas. Pay your Application Feevia myLEO. How do I apply if I only want to take courses to transfer to my current institution? Apply as a non-degree seeking graduate student through Apply Texas, pay the application fee, and submit your official bachelor’s transcript. Non-degree students may take as many courses as they wish but only 12 graduate hours successfully completed in a non-degree status may be applied towards a graduate degree program at A&M-Commerce. Non-degree students are not eligible for financial aid or graduate assistant-ships. International students are not eligible for non-degree status. To submit an application for graduate admission, please complete the online application at the Apply Texas website. We receive applications once a day, every morning. Once we process your application, we will email you with your student ID number (CWID) and password with instructions on how to log into your myLeo account so you can view all your application information and required documents. How do I change from non-degree or certification status to a graduate degree program? A student wishing to change status from non-degree student status to a degree program must file a new application for admission to the Graduate School and satisfy all admission requirements for the specific degree program. No more than 12 graduate credit hours taken in non-degree status may be applied toward a master’s or a doctoral degree. Individual departments will make the final determination on how many semester credit hours (up to 18) a student may transfer from certification status to a master’s degree program. All students should consult with the degree granting program concerning specific departmental transfer criteria. Graduate Admissions – General Information A&M-Commerce Graduate Programs. As a master’s or specialist student, you may request to change your major if you are in good standing with the university (minimum 3.00 overall graduate GPA) and you meet admission requirements for the new program. You may submit a change of major form at any time but if you wish to start the next semester in the new major, you must submit your change of major form and all required documents for the new program no later than 4 weeks (30 days) prior to the first class day of that semester. A change of major request does not guarantee admission into the new program. To complete this process please complete the online Change of Major form. You may contact your Graduate Student Services Coordinator at any time to inquire about your application. You may also track the completion status of your application file by utilizing the application checklist in your myLeo. Below are instructions to access your application status. On the next screen, select your application (if you have applied before, you will see more than one application). Your document(s) have been received and processed if a date appears next to the document(s). A document without a date listed has not been received or processed. Your checklist is updated as documents are received and processed. Most documents (including transcripts and test scores) are posted within 48 hours of receipt. I am an International student and have been admitted, when do I receive my I-20? The Office of International Programs (OIP) is responsible for processing your I-20. You should be contacted by the OIP within three (3) business days of receiving your admissions letter from the Graduate School. After you have completed the OIP requested process, an I-20 is usually issued within 7 to 10 business days. Please watch your email for important information. If you plan to change your visa status from H1B/H4 to F1, please be aware it may affect your tuition status and the documents required for admission. For more information, please contact the International Student Services Office at intl.stu@tamuc.edu or 903.886.5097. I am an international student can I have conditional admissions. Yes. Conditional admission applies to students with complete application packets who do not meet department admissions requirement for full admissions. International students are not eligible for provisional status. I am interested in educator/teacher certification. How do I apply? We do not offer graduate-level initial teacher certification only. Teacher certification/PBTC is only available in conjunction with certain master’s degrees in the College of Education and Human Services. Please contact the Graduate School (graduate.school@tamuc.edu) for details. If you are seeking educator certification in addition to a Master’s degree, you need to apply for the Master’s program through Apply Texas, pay your graduate application fee, and submit your documentation for your intended degree program. Also, contact the Educator Certification Office and complete the Educator Certification application, submit any additional required documentation, including the educator certification fee. I am interested in principal certification or superintendent certification. How do I apply? You may apply for principal or superintendent certification if you are admitted to the master’s of educational administration program or already hold a master’s degree. You need to apply through Apply Texas principal or superintendent certification, submit your application fee, and bachelor’s and master’s transcripts to the Graduate School. Also, contact the Educator Certification Office (903.886.5183) and the Educational Leadership Department (903.886.5520) and submit any additional required documentation for the principal certification. If you are applying for superintendent certification through a cohort, you need to apply as superintendent certification through Apply Texas, submit your bachelor’s and master’s transcripts, and pay the graduate application fee to the Graduate School. Also, contact the Educational Leadership Department (903.886.5515) for further assistance. I want a second master’s as an international student, what do I need to do? International Students: Go to www.applytexas.org and submit a new application and application fee. Upon processing your new application, we will reuse your transcripts and tests scores from your previous application; however, each graduate program has its own discipline-specific admission requirements and may require additional or different documents so you will need to check your myLeo application checklist for any new required documents and submit them. In addition to other documents, you will need to submit new bank and sponsor statements dated no older than 6 months. Domestic Students: Go to www.applytexas.org and submit a new application and application fee. Upon processing your new application, we will reuse your transcripts and tests scores from your previous application; however, each program has its own discipline-specific admission requirements and may require additional or different documents. Please check your myLeo application checklist for any new required documents that you need to submit. Is there an application fee, and how do I pay the fee? Yes, the Domestic students application fee is $50.00 and the international students application fee is $75.00 USD. Please pay your application fee at the time you submit your application through ApplyTexas application. If you did not pay at the time you submitted your application, you may pay online through myLeo. Application fees are not refundable. Is there an application submission deadline? What do the different graduate admission statuses mean? The Graduate School offers various opportunities for graduate admissions. Below are the types of admissions and links to program specific information. Each program/area of study may require additional documents or have different admissions deadlines, so please contact one of the Graduate Services Coordinators for more information. Master’s & specialist degree programs offer full, conditional and provisional admission. Doctoral programs offer full admission. Educator certification, graduate certificates and non-degree programs offer provisional admission and non-degree admission. International students (F1 or J1 visa holders) are eligible for full and conditional admissions only. Full admission is available to applicants seeking a degree program with a complete admission application packet and who meet all Graduate School and departmental requirements. Conditional admission is available to applicants with a complete admission application packet but does not qualify for full admission. This conditional status could be because of a low bachelor’s degree GPA (below 2.75 for most programs/3.00 for business programs) or other departmental requirements. After completing 12 graduate hours, a conditional student must have an overall graduate grade point average of 3.00 or higher. Failure to achieve the minimum 3.0 GPA after completing 12 graduate hours will result in suspension of the student from further graduate study in any degree program for 3 years. Students admitted provisionally must be sure their missing documents are received by the Office of Graduate Studies and all requirements are complete before the end of the first semester of enrollment so the Graduate School can continue the admission consideration process. Completion of the application packet and all requirements on time is the student’s responsibility. Students whose files are not complete during the semester of provisional enrollment will not be permitted to re-enroll or early register until the necessary documentation is received and admission is granted. Financial Aid and Graduate Assistantships are not available while in provisional status. Non-degree complete status is offered to students who have submitted all admission documents and met all admission requirements for a graduate certificate, educator certification, and personal, professional and career development. Doctoral programs accept full admission only. Financial aid is available for full and conditional admission status only. A&M-Commerce is currently not authorized by the state of Massachusetts to provide instruction to individuals who reside in the state of Massachusetts while pursuing a degree with A&M-Commerce. All documents submitted to the Graduate School for admission consideration become the property of the Graduate School. Documents cannot be returned. If your previous university only issues one transcript, please contact the Graduate School (graduate.school@tamuc.edu) or your Graduate Coordinator for help. Note: Each program/area of study may have additional admission requirements or may require additional documents. What happens if I do not meet the admissions requirements? What are your career goals and what degree programs do you intend to pursue? What motivates you or why did you choose this career goal / degree plan? What experience(s) and academic strengths will help you achieve these goals? For additional information on how to appeal the admissions decision, please email Admissions@tamuc.edu . Conditional admission to a graduate degree program means that all documents have been submitted for admission, but the applicant does not meet all requirements for full admission. This could be a low overall grade point average, not meeting departmental requirements, or lack of background for the chosen graduate program. Conditional admission status will change to full admission upon completing 12 graduate hours at Texas A&M University-Commerce with at least a 3.00 overall graduate grade point average. If an overall 3.00 graduate grade point average is not achieved, then the conditional admission status will change to academic suspension. Conditional admission is not available for doctoral admission. Students who have completed graduate hours at A&M-Commerce must have an overall graduate GPA of at least a 3.00 in order to gain admission to a degree program. Financial Aid is available for conditional admission status. means that all requirements for admission have been met and the applicant has been accepted by the department and the Graduate School. Full admission is not the same as admission to candidacy to a graduate program. Students who have completed graduate hours at A&M-Commerce must have an overall graduate GPA of at least a 3.00 in order to gain admission to a degree program. Financial Aid is available for full admission status. Provisional admission means that the applicant’s bachelor’s degree has been conferred, but the applicant has not submitted all admission documents or test scores to A&M-Commerce, but the applicant is allowed to attend for one semester while pending the submission of all documents and/or scores. Provisional admission is not available for all degree programs and is not available to doctoral and international students. Financial Aid is available for full admission and conditional admission status only. What is the 12-hour rule for nondegree students? Students may only use 12 graduate semester hours taken in a non-degree status for a master’s, specialist or doctoral degree. The graduate school strongly advises you to gain admission to a degree program before completing 12 graduate hours. Any test requirement options will be updated on the student checklist after official transcripts are reviewed and processed. Monitor your myLeo application checklist to see when we receive and post your documents. If you have sent documents but do not see posted, please email your coordinator so we can check the status of your document. GRE/GMAT scores must be sent directly to the University by the testing agency. It takes approximately 15 days from the time the scores are ordered for them to be received and posted. Once all required documents have been reviewed and posted to your checklist, your file will be forwarded to your academic area for review. The department has up to 2 weeks to respond with their admissions recommendation so please allow time for the decision to appear in your myLeo. You will also receive an official admission decision letter by email. GRE/GMAT and TOEFL/IELTS scores must be sent directly to the University by the testing agency. It takes approximately 15 days from the time the scores are ordered for them to be received and posted. If admitted, your documents will be forwarded to the Office of International Programs for your I-20 to be issued. You will receive an email from the OIP explaining the process of issuing your I-20 as well as other important information. For information regarding the I-20 process, please visit the OIP website. What should I do if I need to defer my application? To defer your application to a future term, fill out the deferral request form and submit the form to the Graduate School with the additional required documents. You may defer your admissions for up to one year. After one year, you must submit a new application, all additional required documents, and be reconsidered for admissions by your academic area. What transcripts do I submit for my admission? Please request an official transcript be sent to the Graduate School, Texas A&M University, PO Box 3011, Commerce, TX& 75429-3011, from all institutions you have attended, including all undergraduate and graduate coursework. International students should submit official transcripts, which should include original or university-attested individual marksheets along with a copy of the diploma or provisional certificate and an official consolidated marksheet. Consolidated marksheets are not accepted on their own, a complete official transcript must include individual marksheets. If the marksheets are copies, they must have an original university stamp (in color). Marksheets must be attested by the university that the student attended and where the degree was awarded. Marksheets cannot be accepted if notarized or attested by anyone other than the university that issued the transcripts. Transcripts cannot be submitted by email. Degrees must be equivalent to a four-year bachelor’s degree issued by a regionally accredited university in the United States. If you do not hold a 4-year degree and wish to know if we will consider your degree before applying, please contact Vicky Turner for help (vicky.turner@tamuc.edu). All transcripts for degrees from universities in China or Nigeria must be sent directly to A&M-Commerce from the university attended or government body that issues verified official transcripts. Nigerian applicants must also submit a WES evaluation of their transcripts. We accept the basic course-by-course WES or ICAP WES. Upon evaluation of each degree-awarded transcript, if the determination of equivalency cannot be made, the Graduate School may require an evaluation be included in the admission consideration documents and added to the student’s application requirements/documents checklist in their myLeo. Will my documents be returned? No, all documents submitted to the Graduate School for admission consideration become the property of the Graduate School. Documents cannot be returned. If a document is evaluated as unofficial or unacceptable; the document will not be kept and will be shredded. If your previous university only issues one transcript; please contact the Graduate School (graduate.school@tamuc.edu) or your Graduate Coordinator for help.